Italy’s other beautiful lake is Lake Iseo: smaller than its more famous neighbours (15 miles long), but just as perfectly-formed! Nestling amid the scenic mountains, in a bay at the gorgeous Northern end of the lake is the resort of Lovere. 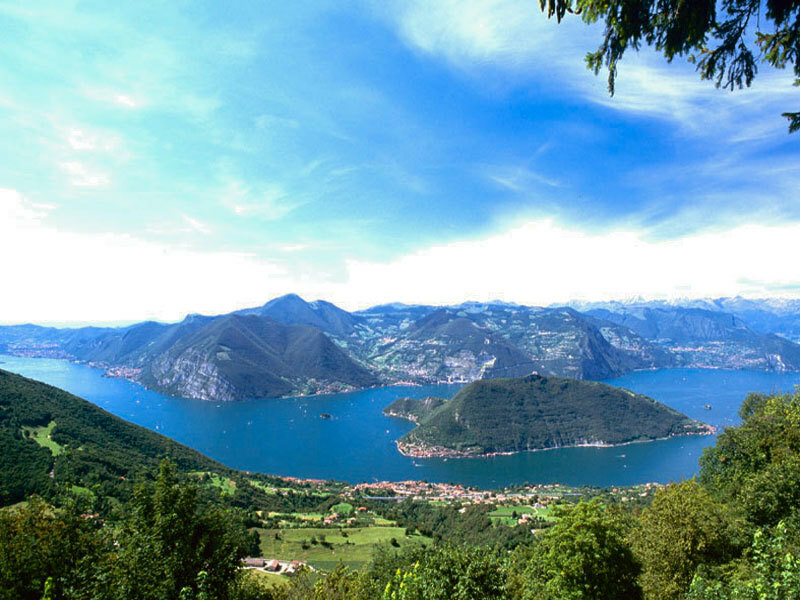 You will walk in the hills close to Lovere, and travel by boat and scenic railway to walk in the UNESCO-listed Valcamonica area, and on Italy’s largest lake island, the appropriately named Monte Isola, ‘Mountain Island’ – it rises a full 420m above Iseo’s shimmering waters. Days Two to Seven: At leisure in the resort with three included walking excursions. Optional excursions, including historic Bergamo, and a scenic trip to St Moritz aboard the Bernina Express Train, will also be available. Walk 1: You walk from the hotel, climbing into the hills behind Lovere. The destination is St John’s Sanctuary, from where there are great views of the lake. Return via a different route, through a grove of chestnut trees, passing the village of Sellere. 6 1/2 miles, 420m of ascent and descent. Walk 2: You travel slowly down the lake by boat, calling in at five lakeside villages, en route to Monte Isola – journey time 75 minutes. You walk 7 miles on Monte Isola, circling the island and climbing 420m to the summit of Madonna della Ceriola. The island has 2000 inhabitants and is also in the list of ‘Italy’s Most Beautiful Villages’. At around 1600 you return to Lovere by boat. Walk 3: Depart by coach to the Naquane Archaeological Park (20 miles). First you visit the Naquane Archaeological Park (entrance fee included) – there are 2 miles of paths here, amid stone carvings of animals and people dating from 3000 BC, There are good views over the valley. You then walk down to Capo di Ponte where you have free time to explore and lunch. After lunch you walk from Capo di Ponte to the medieval villages of Cemmo and Pescarzo and back down – 5 miles, 300m of ascent/descent. You return to Lovere firstly by train to Pisogne and then by ferry arriving back in Lovere at 1730 approx.